This treament uses a heated element to dilate blood vessels just below the skin, increasing the effectiveness of other treatments. It also encourages pores to open up. 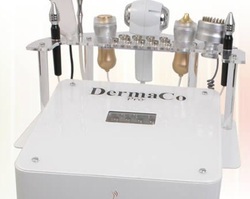 This unique treatment uses a diamond-head abrasion tool, and allows the skin to be regenerated. It achieves this by mechanically exfoliating the upper layers of the skin (the epidermis), which then encourages new skin cells to grow and makes the skin appear rejuvenated. By vibrating at 1-3 MHz, this attachment encourages the production of proteins in cells and the breakdown of fatty deposits such as cellulite. It also encourages the absorption of skincare products. This produces similar results to the Microdermabrasion treatment, but it is more suitable for very sensitive skin. It exfoliates the superficial, scaly laters of the skin, before gently exfoliating this skin and removing the dead skin cells. This provides a non-surgical facelift treatment by passing a harmless electric current through the facial muscle fibre. This tones and firms the face, and provides noticeable results after just one treatment, but is most effective after a course of treatment. This treatment is used after other treatments to prevent toxins entering the pores and refresh the skin after the thermotherapy and ultrasound treatments. Various colours of light can be beneficial to the skin. This treatment uses red light to increase collagen and elastin production; blue light encourages an anti-inflammatory and anti-bacterial effect that helps soothe acne and after microdermabrasion; green light increases melanin production and reduces redness; yellow light encourages lymphatic drainage and detoxifies the face and body.